I have not had my internet set up in my flat yet, but since I am waiting for my car to be serviced at BMW service workshop, might as well use their high speed internet to do some blogging and uploading! I realised that I have not yet posted my introduction on making standard rolls. So here it goes! First of all, lay a nori sheet on your sushi mat which has already been cling filmed. Spread the sushi rice across the nori sheet as shown in the diagram. Lay chicken in the centre.. Put some japanese mayonnaise, and line the avocados. 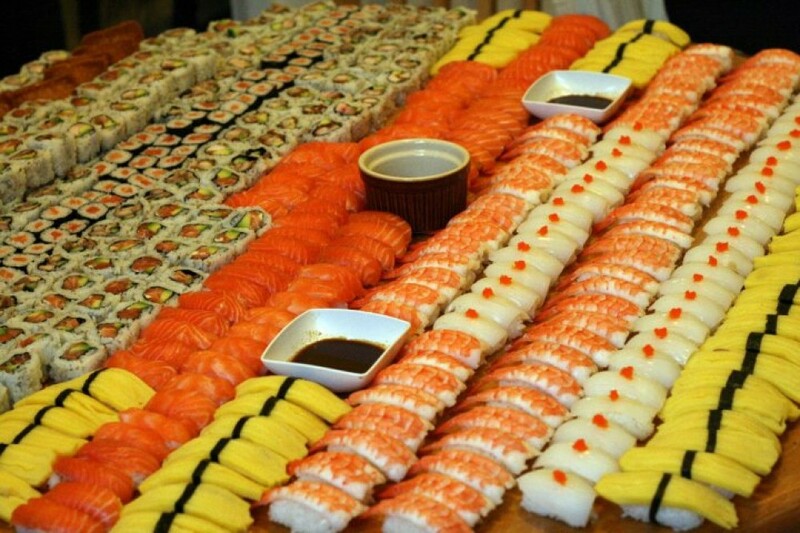 Try not to be too greedy in lining up too much ingredients or you risk being unable to close your sushi rolls. After lining the ingredients, bring the sushi mat forwards as shown..
…just enough to cover the ingredients. put gentle pressure on all sides.. Aim again for the centre of the half lengthways rolls. A link to one of my entries on how to fry the breaded chicken. Or you can use raw salmon! yumsss! Now you are all ready for a sushi picnic! Sorry for the long hiatus. The hiatus would probably get worse in the next two weeks as I just moved to a new flat and I don’t have internet in my new flat. Apparently, the engineers are still in the midst of trying to arrange for someone to climb the pole outside my flat to get my line sorted. It’s been nearly two weeks but I see no line. Managed to get online today thanks to my ex-housemate who let me stayed in glasgow for a night and I could finally get online tonight! So will blog the recipes I have accumulated over the past one week while I still can! Being in a new flat without internet and a TV can be really boring. My body clock has also become a bit haywire as I now sleep in the evening for hours then getting up at like 10pm and baking at 2am in the morning. My neighbours must have mourned having me around working my kitchen mixer in the early hours of the morning. Just started living in my new flat this week. Decided to try out how good is the oven. I have to say I am actually quite impressed that the cake is pretty evenly cooked. Even more so impressed that a simple recipe such as a buttermilk country cake tasted really really awesome! I decided to try a very simple recipe just so that if the oven doesn’t work well, I don’t mourn big time over wasted ingredients and time spent. To my surprise, a simple recipe as such yield such a good result that I am very motivated to bake this again. Moist and tasted similar to a Madeira cake. Definitely better than any waitrose or marks and spencers madeira cake though. Decided to decorate it simple. Poured some bonne maman strawberry jam, dunked some strawberries at the top and sprinkled with some grated white chocolate. Only thing is I have been reading reviews of my new oven Lamona brand provided by the landlord. Never heard of the brand before and decided to google….only to read horror stories by reviewers! Horror of horrors!!! And to think I had a pretty good oven….actually NOT! In fact one of the lowest range of oven brands! Ok…don’t scare myself so sooooon! But I can’t help feeling scared reading all these reviews because I do use the oven big time! I guess nothing can ever beat the Bosch oven I had in my flat in Huddersfield 2 years ago. That was probably the best oven I have ever worked with so far…and everything in my flat then were Bosch equipped (fridge, dishwasher etc…).. I definitely know now what to buy and what not to for my future house! Aside the horror stories, I have been down to Glasgow today, to make a sushi party for a friend’s/cell member’s birthday! Now completely obsessed with my dragon roll, I have been making this for everyone I know…and practice definitely makes perfect! Getting better each time I make this. I left all my sesame seeds in Largs….so had to improvise with all my chives. Quite impressed I managed to make all the sushi despite being down by a left thumb and left index finger. Was cleaning my chopping board and accidentally forcefully knocked my global knife with my right hand causing the knife to fly onto my left fingers. Left me with a stun before I saw blood. 2 immediate lacerations on both fingers of my left hand! NOOO! Disabling! But managed to struggle through and finished making all that sushi. Thanks to an amazing plaster which managed to forcefully hold the lacerated edges together after much pressure and waterproof as well… As good as steristrips. Aunty Yochanna buttermilk country cake. (1) In a bowl, lightly combine the yolks with 40 ml. of the buttermilk. (2) In a mixing bowl, combine all the dry ingredients and mix on low speed for 30 secs to blend. (3) Add the butter and remaining buttermilk. Mix on low speed until the dry ingredients are moistened. Increase to medium speed and beat for 2 mins. to aerate and develop the cake’s stucture. (4) Gradually add in the egg yolk mixture and beat for another min. (5) Pour batter into an 8″ round pan and bake for about 50 to 60 mins. or till skewer inserted comes out clean. (6) Let the cake cool in the pan on a rack for 10 mins then invert the cake onto a cooling rack and leave to cool completely. I thought that staying in Glasgow post-nights on call is just a bit too depressing so decided to make a trip down to Leeds/York to visit my sisters/friends. On the first night, my sisters requested me to make dragon roll. I thought I would like to try Nami’s california roll since I am making sushi. It was delicious. I forgot to put avocados into my california roll!!! But it still tasted delicious. I still think the dragon roll is the most amazing sushi though. We did have one hell of a sushi party in York with my sisters and my sister’s friends. Never felt so satisfied. Of all the sushi I made, dragon roll was the big hit! For garnish, I used ikura (salmon roe), tobiko (flying fish roe), pickled sushi ginger, and wasabi. Again the step-by-step illustrations by Nami is so meticulous that I did not even try to take anymore step-by-step pictures as they can be painstakingly difficult to do so + Nami’s website explains it so well that I can just refer everyone who wants to make california rolls to her website. After I found Nami’s website teaching me how to make dorayaki, I was looking at her beautiful dragon rolls recipe and got very excited about making it. Efforts were not in vain. Love the dragon roll. Only pity was I did not make the unagi sauce as I only looked at the recipe AFTER I finished making the roll. So decided to omit it. I think the most painstaking process of making the dragon roll is slicing the avocado and prepping the prawns for tempura. Making the roll itself isn’t too difficult for me as I have learnt to make sushi rolls before in the past when I worked as a part-time sushi chef. Nami’s website has definitely made me very inspired to make Japanese food! You can choose to make the tempura flour from scratch, or pop by a chinese/Japanese supermarket and buy their ready made tempura flour which makes things fairly straightforward and easy. I did not make the unagi sauce because I realised that it needed boiling etc and cooling down. At the time, I have already finished making the rolls. So decided to skip this. In future, remember to make the unagi sauce first before I start making everything else. I decided to make dorayaki, after skirting through some photos of dorayaki on Facebook. I thought….pancakes bah….shouldn’t be tooooo difficult I hope. It was pretty difficult to control the fire in my kitchen. Somehow, I think an electric hob does a better job than gas when it comes to making pancakes? But I may be wrong. My theory. Dorayaki is basically a red bean filling sandwiched between two pancakes. A wonderful Japanese dessert. I used to eye how 4 dorayaki was sold in a package in the freezer compartment in the chinese supermarket for £6! Does feel like a rip off doesn’t it. Guess it’s more worth it making this at home! My wonderful attempts to make dorayaki. I would not dare to take any praise for these as they look browner in appearance, not burnt. Still taste pretty good, just not quite as presentable. I probably should have reduced the amount of water added into the batter, or perhaps measure the amount of baking powder I was adding into the batter. Also, it would have helped to have my standing mixer in helping me whisk the eggs. I think that would have really helped as I don’t think I have whisked enough. Guess one advice for myself would be not to make dorayaki after a cooking spree of chicken rice and kueh tiao soup as I lost my patience completely while waiting for the dorayaki to cook….maybe that’s why they look browner. Lack of attention to detail, lack of patience to control the heat and timing. It is crucial that the pan has to be fairly medium heated so that the dorayaki will rise whilst cooking, as if the heat is too low, it takes almost 15 minutes to cook one side and the dorayaki did not rise (you don’t see bubbles rising on the surface). I had experimented with the extremes of heat and settled for medium heat. Even so, I can’t stop my dorayaki from looking so brown, not burnt. But I put the recipe on for those who have requested for it. Just a few pictures below to entice my readers on what I cooked for dinner tonight. Kueh tiao soup was a bit of a failure…cuz I have transported most of my ingredients over to my new flat and hence lacked the authentic sarawak white peppery taste. What a shame. Also…felt that I could have been more generous with using more chicken carcasses to enhance the taste. 1) In a large bowl, combine eggs, sugar, and honey and whisk well until the mixture gets fluffy. 2) Sift flour and baking powder into the bowl and mix. Keep in the fridge to rest for 15 minutes. 3) Stir in ½ Tbsp of water at a time to get the right consistency. It should be a little bit thicker than pancake batter. If the batter is too thin, Dorayaki buns will be too flat and not fluffy. 5) Make sandwich with red bean paste. Put more red bean paste in the center so the shape of Dorayaki will be curved (middle part should be higher). Quickly wrap them with saran wrap until you ready to serve. Will definitely practise again. This time using my standing mixer to whisk the eggs till totally fluffy and repost the pictures. Ok. I will let the pictures do the talking. First of all prepare the sushi rice. I tend to use nishiki brand as that is the only reliable sushi rice brand I know of. I have tried a few other brands in the past as they were cheaper and to be honest with you, there is a huge difference in the quality of sushi you make. I once used a sushi rice of some unknown japanese brand which was like 50p cheaper and I thought won’t make much difference one lah…it’s all sushi rice anyway….but you know what, the cooked sushi rice refused to stick to the seaweed. My housemates who were also ex-sushi chefs didn’t believe me and tried as well before we all declared the sushi rice was just pure nonsense as it just won’t stick to the seaweed! I ended up throwing the whole pot of sushi rice in the bin! In summary, don’t cut cost on sushi rice. You really pay for what you get! Nishiki brand, and no other. As to how to prepare the rice, I cannot stress enough the importance of not putting too much water into the rice before you cook. Check your water level is correct with your finger (cook like how you are cooking normal rice but with slightly less water) and also double check with your rice cooker instructions i.e. if you cook 5 cups, make sure that the water is at the level ‘5’ on the rice pot. If your rice is very wet, you are in for failure so don’t even attempt or you get sushi mash. If you get sushi mash, you might as well not make because no one is going to eat your sushi as it will taste like glue. Wrap your sushi mat with cling film just to make your cleaning up easier at the end. After trying tesco, sainsbury, morrisons, costco avocados…the best is still the ripe and ready sainsburys avocados. Tesco, morrisons etc just cannot make it. No questions ask. You can try avocados from other places if you want, don’t say I never warned you. The taste and the texture of the sainsbury avocado is exactly what I am looking for. Next, take out the seaweed. Can you see how there are horizontal lines across the seaweed? Put your seaweed meeting the end of the sushi mat. Spread rice across the seaweed. No higher above 2 grains of rice thickness. Flip it the other way round now. Can you see how I have some rice overlapping out of the top of the seaweed? Line whatever you want in your sushi on the seaweed. I put japanese mayo, chicken katsu and avocados across… don’t be greedy and put too much ingredients because you are only asking for trouble when you realise you cannot close your rolls. Roll like the picture. Put some gentle pressure on the ingredients to stop them from falling forwards when you roll the sushi forwards. There you go…some inside out rolls for you to drool at…. I will teach how to cut another time and also how to make other rolls. Sushi rolls does not necessarily have to contain raw fish. You can be a bit more imaginative and include yummy fried chicken or roast chicken if raw fish is not one of your favourites. In this post, I am going to teach you how I fry my chicken for either the katsu curry or to include into the rolls as seen in the picture below. Crack 2 eggs into a bowl, season with salt and black pepper. Beat well. In another dry bowl, pour in some japanese breadcrumbs. Deboned chicken thighs. Or you can use chicken breast depending on what you prefer. That’s the brand of the japanese breadcrumbs I have been using for many years. Get everything ready before you start. Pour some oil in a pan enough to cover 2/3 of the chicken. When the oil in the pan is hot enough, put in enough chicken to deep fry till golden brown. Don’t you feel the deep fry chicken calling out to you!!! Next entry on sushi making chapter 4 will be on how to roll the chicken rolls!